I talked to Mark about the blade today... It looks like the tip is really corroded and could have extended a bit more... 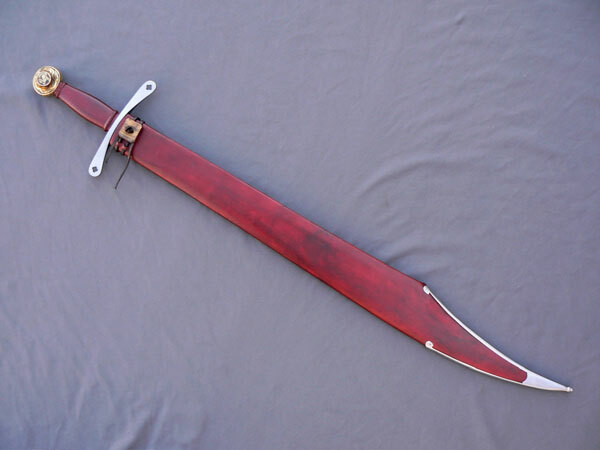 In any case, I think the plan will be to keep the blade about 32 inches in length, with 22 inches being the main shaft, and the last 10 inches being the curved tip. I want the width at the hilt to be at 1 and 7/8 inch, and increase in width to a max of 3 inches at the peak of the false edge/beginning of curved tip (at the 22 inch mark). The vassal did a nice job of curving both the true and false edge in saber-like fashion... The original is rusted and lost a lost of mass, so I think going to a max width of 3 inches at the 22 inch point where the false edge curves outward to a peak will be nice and still be near identical to the original (as it may have been when it was new) The original really is corroded in the area of where the false edge curves outward at the beggining of the curved tip. The curved end on the fullers is a nice original feature, we look forward to incorporating those. Chad, what do you think of the original guard cuttouts? Quatrefoils or crosses? The look kinda rounded like Quatrefoils? anyone else notice that funny symbol on the body of the blade? I just picked up this thread and so will hark right back to the beginning. I made a copy of the Conyers years ago for a member of the family and so got excellent photos from the Cathedral, which I then had to return.........but here is the result. 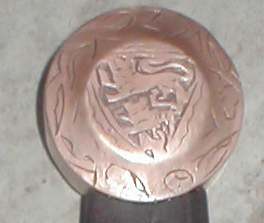 The engraving on the original was pretty crude and thankfully my engraving back then matched it quite well! It was discussed here the merits of improving on original work by doing it better or more exactly than the original, but for me the replica will then lose its 'realness'. It is not to say that every stroke must be the same as the original, but by trying to work in the same way the spirit of the original will be kept. One side was a spread eagle much like the imperial german symbol and the other was I guess the 3 lions of England as found on various royal heraldry and indeed on modern English soccer shirts. The outer marks on the pommel were too indistinct to do anything but copy the lines down as they were and whatever it actually was has been lost to time. The cross guard was a less interesting piece and was altogether rather clumpy, and the engraving all rather indistinct due to a serious lack of talent of the original engraver but once you can start to see the beasts with wings (griffins?) it all becomes a bit clearer. Looking at the photos that were supplied I would never have described the original sword as a quality piece as far as decoration goes, but technically to make a blade nearly 4" broad and 1/16" thick at the tip and for it to survive (albeit with a small crack) speaks of a skilled smith. From memory the blade started about 5mm thick and near the tip was about 1.5mm (about 1/16") so it would have been pretty wieldly. On the point of weights, I am working on one for myself at the moment that is pretty short admittedly, but is about 4.5mm near the hilt and under 2mm at the tip and weighs in under 2llb. To me they look like punched crosses which weren't cleaned up to be nice and square. I'm not sure how Christian is going to be doing those....but if he can punch them it'll probably replicate the look better. Awesome! 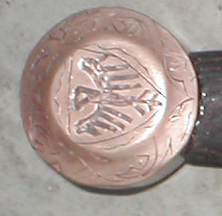 The Conyer's symbols on the Pommel are really amazing... I was hoping to obtain those as well. By the way, I'll have to show you by what I mean about the symbol on the blade, maybe it was the original blademakers symbol... I'll do a crop and post the picture so I can get it below 150K (the limit). I received the final drawing of the blade design from Mark in the mail yesterday and I think it is absolutely perfect. Excellent!! I'm really looking forward to seeing this one completed. 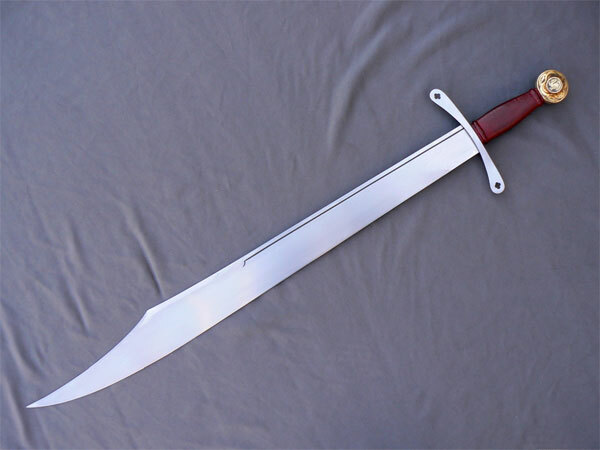 In any case, if anyone has suggestions for a scabbard design for the Thorpe Falchion, that would be appreciated. I've been getting regular updates from Christian Fletcher with pictures and hopefully he will put them on his website at some point. That came out real nice. 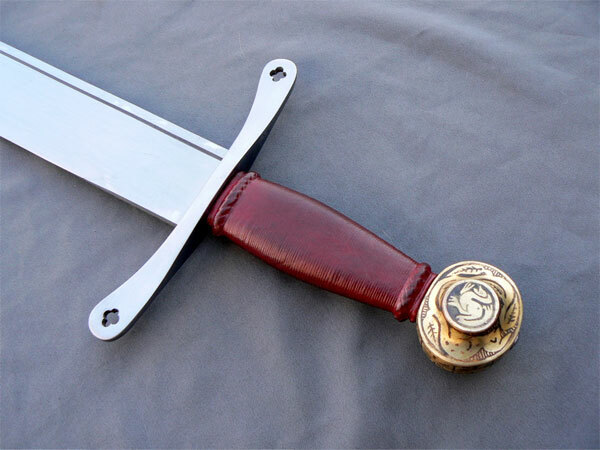 The pommel engraving, the scabbard furniture and the blade/guard themselves all work together to make a very attractive piece. Very nice and the closest repro I've ever seen of this one. There are a few differences from the original still, but they're small. Very, very nice. Is the blade by Ollin? works very well. Congrats ! Beautiful! If you haven't already done it, be sure to share the photos with the folks at the museum. They'll get a kick out of it, I'm sure. I still haven't heard from Alan West... he never responded to a couple emails. What are the final dimensions of your replica? Overall length, blade length, blade width, crossguard width, weight etc? Do you have a pic of your replica & the original thorpe falchion for comparison?